USS DULUTH was the third amphibious transport dock in the AUSTIN - class and the first ship in her class to be decommissioned. The DULUTH was last homeported in San Diego, Calif. Builder: New York Naval Shipyard, Brooklyn, N.Y. This section contains the names of sailors who served aboard USS DULUTH. It is no official listing but contains the names of sailors who submitted their information. 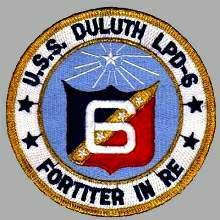 Click here to see which USS DULUTH memorabilia are currently for sale on ebay. 18 Dec 1965: Commissioned [Special]. The “special” designation reflected the amount of uncompleted work that restricted the operational capabilities of the ship. 1 - 2 Feb 1966: Transit to Philadelphia Naval Shipyard to complete fitting-out due to impending closure of New York Naval Shipyard in July 1966. 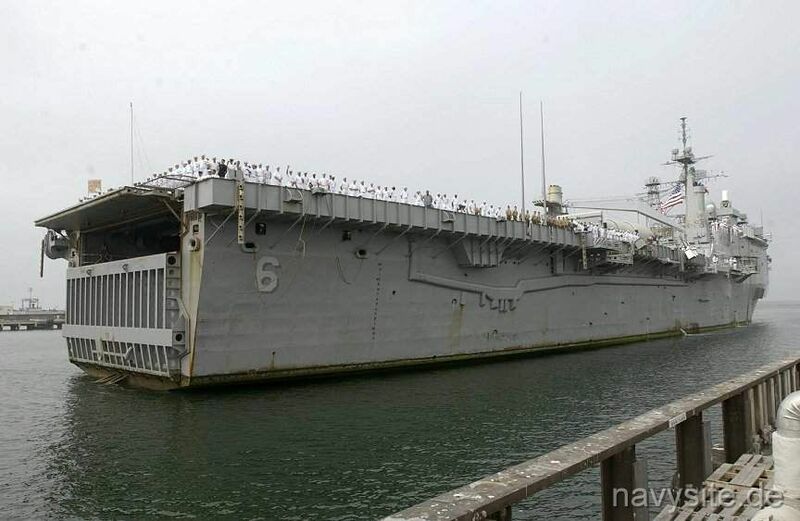 2 Jun 1966: Commissioned at the Philadelphia Naval Shipyard, Capt. Mark G. Tremaine in command, and sailed for Norfolk, arriving there the following day. 15 June 1966: A Sikorsky H-34 from HC-4 made the first helicopter landing on board. 5 - 20 July 1966: Following four weeks of shakedown training in the Virginia Capes Operation Areas, DULUTH sailed for her homeport at San Diego. She transited the Panama Canal on 11 July and arrived in San Diego on 20 July 66. Aug - Sep 1966: DULUTH underwent refresher training and completed final acceptance trials before Commander Amphibious Squadron Nine broke his pennant in the ship on 16 September. 24 Oct 1966 - 21 Jan 1967: Post-shakedown repair availability, Long Beach Naval Shipyard. Jan - Mar 1967: Carried out shore bombardment exercises, boat operations and refresher training through February before conducting amphibious Exercises Silverpoint IV and Silverpoint V off Camp Pendleton in late March, all in preparation for her first Western Pacific (WestPac) deployment. First landing of a USMC CH-53A took place on 13 March 1967. 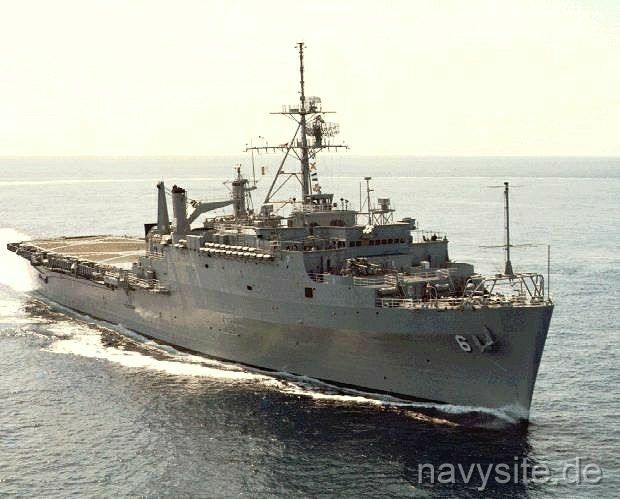 April - May 1967: Departed San Diego on 10 April and sailed to Danang, Republic of Vietnam, arriving there on 28 May after stops at Pearl Harbor; Pago Pago, American Samoa; Fremantle, Australia and Subic Bay, Philippines. May - Nov 1967: Operated with Amphibious Ready Group, Seventh Fleet, in South China Sea. Conducted amphibious landing operations Bear Claw and Beacon Guide at Hue (7 June), Chu Lai (12 June), Cue Viet (3, 27 July), and Phu Loc (21 July). Took part in Operations Beacon Gate at Song Cua Dai and Chu Lai (7 - 16 August) and Beacon Point off Thua Thien province. The LPD then steamed off Quang Nam and Quang Tin provinces during Operation Ballistic Charge (16 - 28 September). After refitting at Subic Bay, DULUTH participated in helicopter-centered Operation Bastion Hill near Cua Viet (10 October - 1 November). Following vehicle ferry operations from Subic early in the month, the LPD steamed to Hong Kong, arriving there 17 November. Nov - Dec 1967: Departed Hong Kong 22 November and, after stops at Okinawa and Yokosuka, Japan, and Pearl Harbor, DULUTH arrived home in San Diego on 15 December. Dec 1967 - May 1968: Post-deployment stand down and inspections interspersed with Exercise HeliEx 2-68 (25 - 28 March) off Camp Pendleton that included the coordinated lift of 122 Marines in 23 UH-34 and CH-53 helicopters from ship to shore and Exercise Beagle Leash (23 April - 1 May) at San Clemente that involved the landings of 325 marines in LVTs and LCM-6 landing craft. 6 May - 6 July 1968: Restricted availability, National Steel and Shipbuilding Co., San Diego. July - Oct 1968: Refresher training and inspections in preparation for deployment. Nov 1968: Departed San Diego 2 November and sailed west, relieving DUBUQUE (LPD 8) as unit of Amphibious Ready Group off Vietnam on the 23d. Dec 1968 - Jan 1969: Conducted Operation Tight Jaw (15 - 17 December) to repatriate seven North Vietnamese prisoners off Vinh, Operation Valiant Hunt (18 December 1968 - 5 January 1969), a cordon-and-search mission in Quang Nam Province and Operation Bold Mariner (13 - 25 January), an amphibious and helicopter assault on the Batangan peninsula. Elements of Battalion Landing Team 2/26 deployed ashore in eleven LVTs and in 226 helicopter sorties by HMM-362. 27 Jan - Feb 1969: Five-day Port visit to Hong Kong starting 27 January and replenishment and maintenance at Subic Bay. Feb - March 1969: DULUTH returned to Danang Harbor on 13 February, backloaded BLT 2/26 and steamed off the coast for the rest of the month. The LPD then conducted Operation Eager Pursuit I and Operation Eager Pursuit II (1 - 26 March), two search, clear and destroy missions in Quang Nam province. 27 March - 14 April 1969: Port visit to Keelung, Taiwan, and upkeep at Subic Bay. April - May 1969: Returned to Danang and participated in Operation Eager Pursuit III (16 - 26 April). Following a two-company size practice amphibious landing near Danang, DULUTH participated in Operation Daring Rebel (5 - 25 May), a mainly amphibious assault on Barrier Island, 23-miles south of Danang. After backloading units of BLT 1/26, DULUTH then helped launch Operation Gallant Leader (23 - 25 May), a helicopter and surface craft landing off Marble Mountain near Danang. May - June 1969: DULUTH steamed to Subic Bay on 26 May and was relieved of TG 76.4 duties by CLEVELAND (LPD 7) on the 31st. Underway for Okinawa on 1 June, the ship stopped in Buckner Bay to unload supplies before proceeding to Yokosuka, arriving there on 7 June. Following a short port visit, DULUTH sailed for home on the 13th, reaching San Diego on 26 June. Aug - Nov 1969: After a month of preparation, DULUTH entered the Long Beach Naval Shipyard for overhaul on 5 August. Work on the ship continued until 14 November and included repairs and alterations to the well deck tanks and improvements to the flight deck. Nov 1969 - April 1970: Inspections and refresher training out of San Diego. May - Dec 1970: Underway for a WestPac cruise on 1 May, DULUTH loaded BLT 1/9 at Okinawa for transfer to Subic Bay at the end of the month. 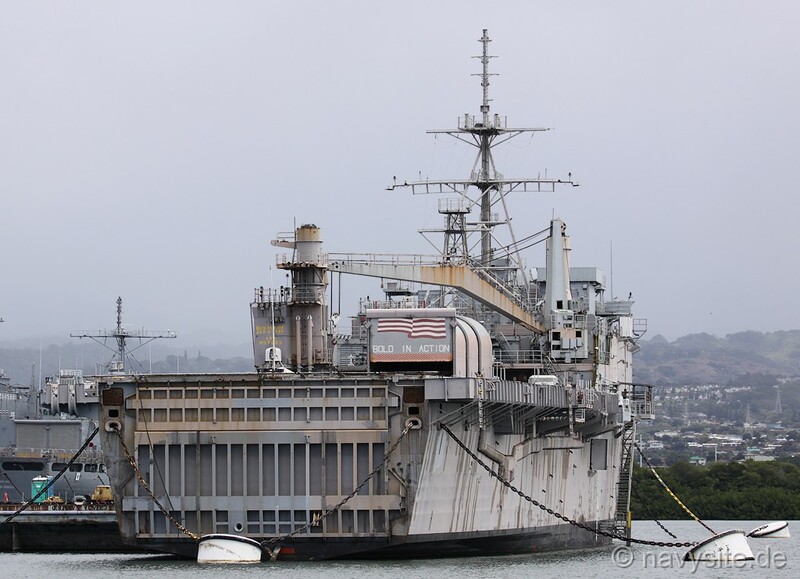 She then made several cargo lifts to Danang or to Yankee Station, delivering an H-3 helicopter to AMERICA (CVA 66), spare parts, and carried YFU 52 back to Subic Bay before steaming to Sasebo, Japan, for rest and recreation 3 - 15 July. 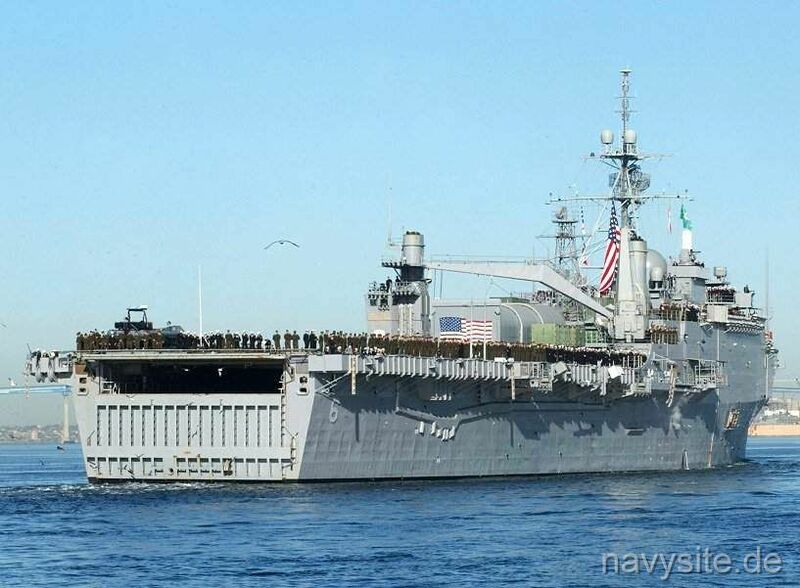 Returning to Subic on the 19th, she spent the next three months conducting amphibious training and logistics operations from Subic to Danang and Vung Tau. In mid-October, DULUTH embarked 140 Philippine marines for a joint exercise near Manila, but disaster recovery efforts in the wake of Typhoon Joan forced a cancellation of the operation. Arriving in Lagoney Gulf on 22 October, DULUTH operated as a fuel stop and ready deck ship for helicopters during three days of relief operations in a swath of devastated barrios and villages 80 by 20 miles wide and including the cities of Virac and Naga. 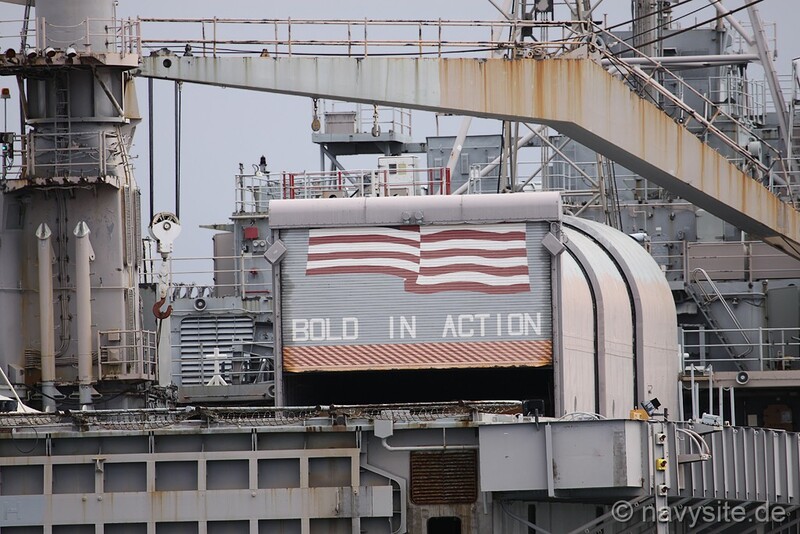 Following another month of logistics support out of Subic Bay, DULUTH steamed for home, reaching San Diego on 10 December. June - Aug 1971: Departing San Diego on 10 June for a summer Midshipman Cruise, DULUTH visited Auckland, New Zealand (25 - 30 June) and Sydney, Australia (6 - 12 July) before putting in to Pearl Harbor on 24 July. DULUTH then transported the U.S. Naval Academy yacht DUELLO from Hawaii back to San Diego, arriving there on 2 August. Oct 1971 - Aug 1972: After a restricted availability to repair a damaged rotor blade in her port turbine, DULUTH sailed for another WestPac deployment on 1 October. The ship loaded elements of BLT 2/4 at Okinawa on 18 October before resuming Danang logistics support operations out of Subic Bay. The LPD delivered vehicles, equipment and humanitarian supplies to Danang and embarked deck cargo and damaged PTFs for return to Subic. The LPD remained there until through the winter, conducting the occasional amphibious exercise in the Philippines and transporting troops and supplies between Subic Bay and Buckner Bay. On 1 April, following the outbreak of the North Vietnamese “Easter Offensive,” DULUTH sailed to a holding station off South Vietnam to await developments. With the North Vietnamese offensive blunted by the end of the month, the LPD steamed to Subic Bay for rest and relaxation, 8 - 21 May. Returning to Vietnam, DULUTH embarked 300 South Vietnamese marines at Tan My and landed them at Quang Tri on the 24th, during which operation DULUTH took desultory enemy fire from a shore battery. The LPD conducted a similar mission in early July, when Marine helicopters deployed South Vietnamese marines during Operation Lam-Son 72, before sailing for home on 14 July and arriving in San Diego on 4 August. 20 Dec 1972 - 3 April 1973: Overhaul at National Steel and Shipbuilding Co., San Diego. 20 April 1973: During interim refresher training, the civilian yacht ZARPOR DOS lost engine power and collided with DULUTH, injuring a civilian. 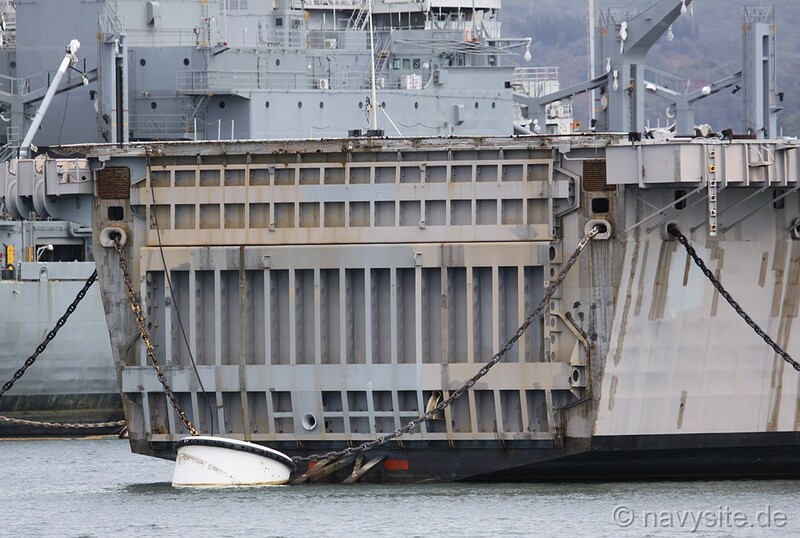 After disengaging the yacht’s mast from the LPD’s port catwalk, the stricken boat was towed to NAS North Island. June 1973 - Jan 1974: DULUTH got underway for another WestPac tour on 4 June, joining TG 76.4 for operations in and around the Philippines. In August, DULUTH sailed to the Gulf of Thailand for Operation Eagle Pull, and the withdrawal of the last American combat forces from Southeast Asia. Following a joint U.S.-Philippines exercise called Operation Pagasa II in late September, DULUTH steamed to Triton Island in the Paracels to assist in the salvage of USNS SGT JACK J. PENDLETON (T-AK 276), where she served as a command center, equipment transfer point and berthing area. Following visits to Hong Kong and Kaohsiung, Taiwan, the ship sailed for San Diego, arriving there on 3 January 1974. Jan 1974 - Jan 1975: Refresher training, readiness inspections and local operations out of San Diego. 5 Jan - 26 Feb 1975: Overhaul, Long Beach Naval Shipyard. March - May 1975: On 28 March, DULUTH got underway for a WestPac deployment via Pearl Harbor, Okinawa and Subic Bay. Arriving off Vung Tau on 21 April, DULUTH participated in the evacuation of almost 9,000 people from Saigon; 1,373 Americans and 6,422 of other nationalities, mostly South Vietnamese. On 29 April, fourteen landings by South Vietnamese, Marine and Air America helicopters deliver over 900 refugees to DULUTH alone, including the Italian ambassador. The refugees were later transferred to USNS SGT. TRUMAN KIMBRO (T-AK 254). The following day another 1,391 refugees arrived, forcing DULUTH’s crew to jettison three RVN helicopters over the side to make room for the arriving H-53 helicopters. The ship then steamed to Subic Bay and disembarked the refugees on 5 May. Over the next four days, working parties of volunteers reported to Grande Island to assist and process refugees. 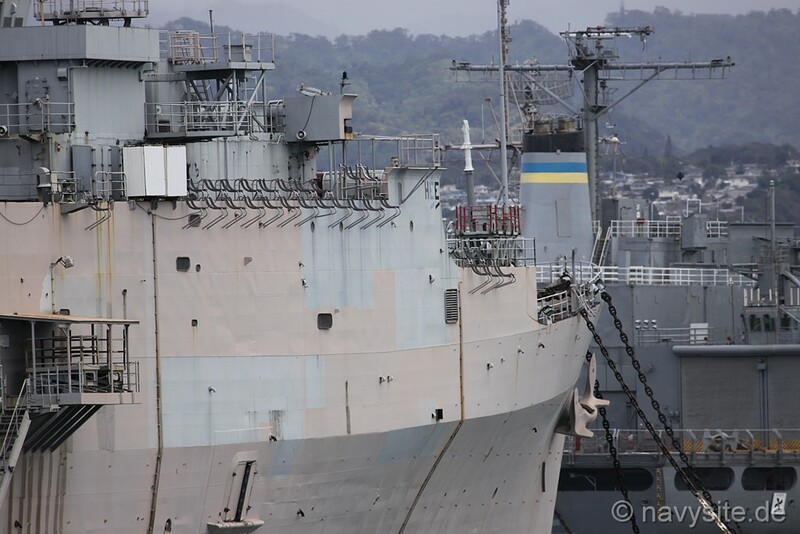 The LPD remained at Subic through the end of the month for cleaning ship. June - Nov 1975: DULUTH operated with 7th Fleet units out of Subic Bay for the next four months, conducting landing exercises, carrying cargo between Okinawa and the Philippines, cruising in the Tawan Straits and, in August, participating in a joint U.S.-Thai ASW training exercise. 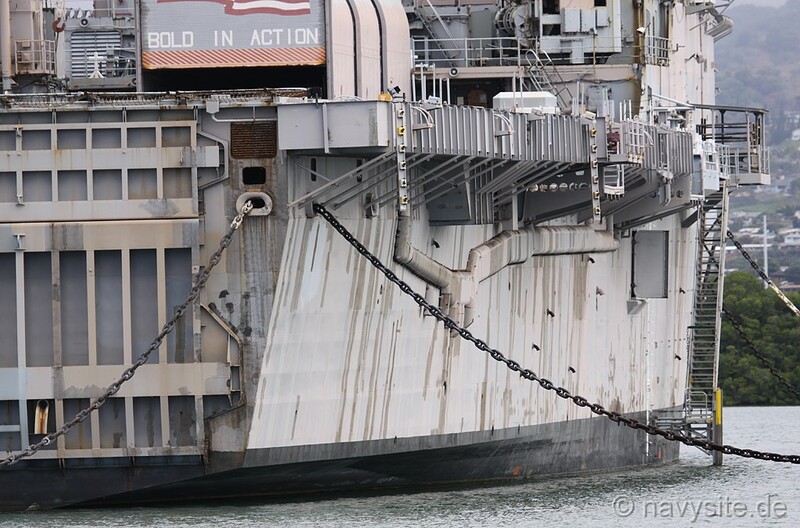 The LPD returned to San Diego on 16 November. Jan – Jun 1976: Intensive preparations for major overhaul while at NAS North Island and alongside SAMUEL GOMPERS (AD 37). 12 July 1976 - 4 June 1977: Overhaul at National Steel and Shipbuilding Co., San Diego. During overhaul, the entire exterior of the ship was sand blasted, primed and painted and the ship received new zincs, sea valves, rudders and screws. June - Sep 1977: After returning to San Diego on 4 June, the ship’s crew spent the next three months conducting refresher training, inspections and readiness evaluations. Sep 1977 - April 1978: Underway on 13 September for her first WestPac deployment in almost two years, DULUTH steamed to Okinawa with BLT 2/3 embarked. Once there, the LPD conducted amphibious training operations out of Subic Bay in the Philippines area through the end of the year. Over the winter, DULUTH conducted mine warfare exercises with Philippine, South Korean and Japanese Self-Defense Fleet detachments before returning home to San Diego on 27 April 1978. May 1978 - July 1979: Local operations included type training, amphibious exercises, training of Iranian Navy midshipmen and helicopter landing qualifications. In the spring, the LPD sailed north to Vancouver, British Columbia, for a port visit on 13 April. Following a successful in-service inspection in May, the LPD got underway for a long WestPac deployment on 23 July. July 1979 - Feb 1980: DULUTH operated primarily out of Subic Bay, though in October the LPD sails to Australia for Exercise Kangaroo III in Shoalwater Bay. Visit to Sydney (1 - 8 Nov). While en route back to Subic Bay, DULUTH swung east for stops in New Caledonia and Fiji. Returned to San Diego on 14 February. 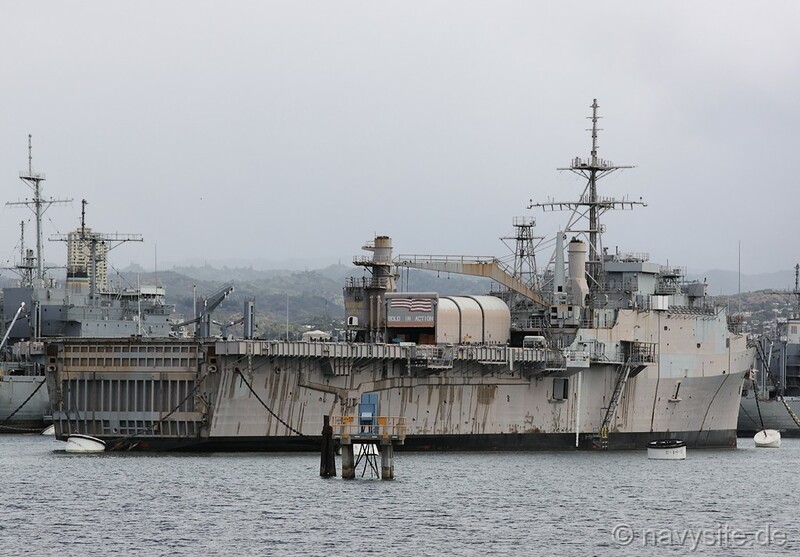 2 April 1980 - 17 April 1981: Regular Overhaul begun at Todd Pacific Shipyard, San Pedro. On 28 July, the International Marine Shipbuilders Union goes on strike and all work on the ship stops until the strike settled on 2 October. Nov 1981 - May 1982: After six-months of local operations and amphibious exercises out of San Diego, DULUTH deployed on 12 November as part of Amphibious Squadron One, with HMM-265 embarked. The Squadron visited Singapore in early January, made a stop at Diego Garcia mid-month and swing south to Perth Australia on the 28th. In February and March the Squadron conducted operations off Okinawa and South Korea, before sailing for home, with the LPD arriving in San Diego on 15 May. May - Nov 1983: Underway 4 May for WestPac deployment with HMM-165 and BLT 3/3 embarked. While en route to Subic Bay, DULUTH conducted AV-8A Harrier training. In July, the amphibious ship participated in Exercise Cobra Gold in Thailand, followed by a cruise in the Indian Ocean in August that ended with port visits to Berbera, Somalia and Mombassa, Kenya. In September the ship sailed north, passing through the Suez Canal on the 11th, and joined the Multi-National Peacekeeping Force off Lebanon for a month of operations. Passing back south through the Suez Canal on 11 October, the LPD sailed for home, arriving in San Diego on 22 November after stops in Subic Bay and Pearl Harbor. 23 Jan - 27 March 1984: Restricted Availability at NAS San Diego. June 1984 - April 1985: Following three months of refresher training, DULUTH got underway 27 June for a cruise to Alaska and Washington. Returning to San Diego on 13 July, the LPD participated in Exercise Kernal Usher 84-2 in August before getting underway on 18 October for WestPac ’84 out of Pearl Harbor. Sailing on to Numazu, Japan, on 6 November, DULUTH operated around Japan until the end of December when she sailed for Thailand. Following a five-day visit to Phattaya Beach in early January, the ship conducted Exercises Landex in the Philippines, Valiant Usher 85-2 at Okinawa and Team Spirit 85 in Korea before sailing for home, arriving in San Diego on 26 April. 30 Sep 1985 - 27 June 1986: Restricted overhaul at Northwest Marine Iron Works, Swan Island, Portland, Oregon. July 1986 - May 1987: Inspections, refresher training and pre-deployment preparations. June - Dec 1987: DULUTH deployed with Amphibious Ready Group Alpha on 18 June, sailing to Okinawa and then on to Subic Bay for exercises. During a group sail to the Gulf of Thailand, Soviet Bear and Badger aircraft shadowed the ships. Later in the month the LPD participated in Valiant Usher 87-3 off western Australia, before conducting Exercise Valiant Blitz 88-1 off Korea in late October and Balikatan 87 out of Subic Bay in November. The ship returned to San Diego on 18 December. Jan - Dec 1988: BLT and air services training, maintenance, inspections and pre-deployment preparations, including Exercise Kernal Usher 89-B. Jan - June 1989: Underway 12 January, DULUTH participated in Team Spirit 89 off Korea in March and Valiant Usher 89 off Australia before returning to San Diego on 19 June. 10 Aug - 16 Sep 1989: DULUTH sailed to Prince William Sound, Alaska, for oil spill decontamination operations with HMM-268 embarked. DULUTH housed clean-up crews, provided medical and weather forecasting services and supported decontamination barge efforts. 28 Dec 1989 - 12 Jan 1990: While operating in southern California waters the LPD hosted a USCG Law Enforcement Detachment for anti-drug smuggling operations. 5 Feb – 7 May 1990: In Southwest Marine Shipyard, San Diego, for a three-month phased maintenance availability that highlighted the excellent condition of DULUTH's diesel engine and steam boilers. Sep 1990 - 6 March 1991: Underway 24 September, DULUTH sailed to Pearl Harbor and then on to Subic Bay for Exercise Valiant Mark 91-1. In November, the LPD took part in Valiant Blitz 91-1 off Korea before providing disaster relief efforts at Cebu City, Philippines, following Typhoon Mike. 7 May - 18 Aug 1991: Drydock phased maintenance availability at Southwest Marine Shipyard, San Diego. Jan - July 1992: Departing San Diego on 6 January, DULUTH sailed to the Philippines via Pearl Harbor and Guam for exercise Valiant Usher 92-3 in February. After a short period of up keep at Subic, the LPD sailed south into the Indian Ocean and then north where she entered the Arabian Gulf for the first time in her career. 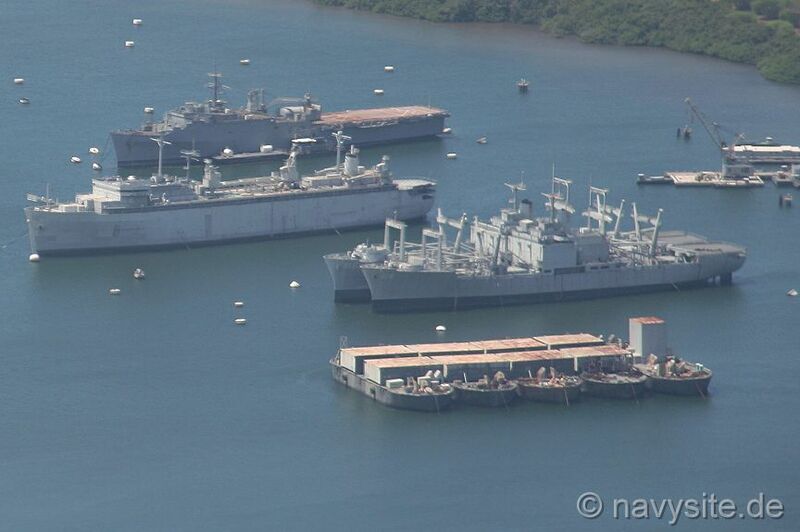 In between two amphibious exercises in Kuwait in March and April, DULUTH visited Mombasa, Kenya. Arriving in Thailand in mid-May, the ship participated in Cobra Gold 92 before steaming for home, arriving in San Diego on 6 July. 15 Sep 1992 - 11 Jan 1993: Underwent phased maintenance availability at NAS San Diego. 4 - 29 April 1993: Short cruise to British Columbia for MarCot 1-93 and port visits to Esquimalt and Victoria. Jan - July 1994: Underway 21 January for WestPac operations. Arrived in Singapore 14 February and assigned to TG 76.5 for duty off the coast of Somalia. 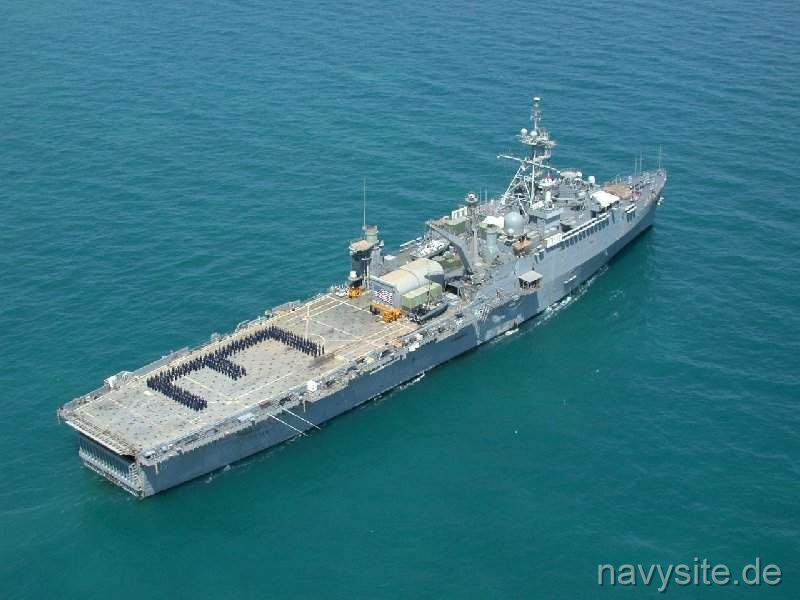 The ship remained in Singapore for six days before getting underway for the Indian Ocean and arriving off Mogadishu on 3 March to assist in the evacuation of American forces from Somalia. She remained there, other than a short trip to Melindi, Kenya, until 24 April when the LPD steamed to Mombassa. DULUTH then steamed off Kipini, Kenya, holding for possible contingency operations owing to the civil war in Rwanda, until 4 June when she sailed for Fremantle, Australia. Following a five-day port visit, the LPD returned to San Diego via Pearl Harbor, arriving home on 21 July. Aug 1994 - Jan 1997: Upkeep, local operations, inspections and training out of San Diego through 1995. 17 Jan - 6 June 1997: Maintenance Availability, Southwest Marine, San Diego. July 1997 - May 1998: Following overhaul, DULUTH made a short midshipmen cruise to Victoria, British Columbia and Oakland, Calif. In October, the ship carried Army equipment to Everett, Wash., and she visited Vancouver before returning to San Diego on 26 November. After completing amphibious readiness training in May 1998, the ship began preparations for an overseas deployment. June - Dec 1998: Underway 22 June, DULUTH sailed across the Pacific and into the Indian Ocean via Pearl Harbor, Hong Kong, Singapore and Port Klang, Malaysia. After a short visit to the Seychelles, the LPD entered the Arabian Gulf on 27 August for exercises off Kuwait and Saudi Arabia. DULUTH participated in Maritime Interdiction Operations (MIO) in the northern Arabian Gulf in October and early November as tensions rose over Iraqi violations of the 1991 ceasefire agreements. Departing the region on 13 November, DULUTH sailed for home and arrived in San Diego on 22 December. Jan 1999 - July 2000: Local operations out of San Diego. Aug 2000 - Feb 2001: Underway 14 August for operations in the Indian Ocean as part of the TARAWA (LHA 1) Amphibious Ready Group. Following stops at Pearl Harbor and Darwin, Australia, DULUTH conducted three days of humanitarian assistance operations off East Timor (14-16 Sep) before a one-day stop at Singapore on the 21st. Moving into the Indian Ocean, the ARG stopped at Phuket, Thailand (28 Sep - 1 Oct) before steaming on to the Seychelles, where they arrived 9 October. Three days later, DULUTH received word that COLE (DDG 67) had been bombed in harbor at Aden, Yemen, and the LPD quickly steamed north to Aden to provide small boat and helicopter operations in support of COLE. Following a short cruise north to Bahrain in late December, DULUTH sailed east, arriving in San Diego on 14 February. While en route, the LPD stopped at Iwo Jima to launch amphibious vehicles in commemoration of the World War II battle. 21 May - 3 July 2001: Maintenance availability, Naval Station, San Diego. Jan - July 2003: Underway for Operation Iraqi Freedom on 06 January, DULUTH loaded elements of the 15th Marine Expeditionary Unit and HMM-161 and sailed west. After a brief stop in Singapore on 29 February, the ships sailed into the Indian Ocean and arrived in the northern Arabian Gulf on 10 February. The LPD operated at sea until 19 March when hostilities began in Iraq. The ship suffered casualties on 22 March when one of her deployed helicopters collided with a helo from HMS ARK ROYAL. After the initial surge of Marines ashore, DULUTH’s crew conducted boat operations in support of operations around Iraqi oil pipeline terminals. Departing the Arabian Gulf on 27 May, the ship stopped at Cairns, Australia and Pearl Harbor before arriving home on 23 July. Dec 2004 - Feb 2005: Deployed with Expeditionary Strike Group (ESG) Five to the Western Pacific. While anchored at Guam on 28 December, the LPD was ordered south for Operation Unified Assistance to aid victims of the devastating Indian Ocean tsunami. 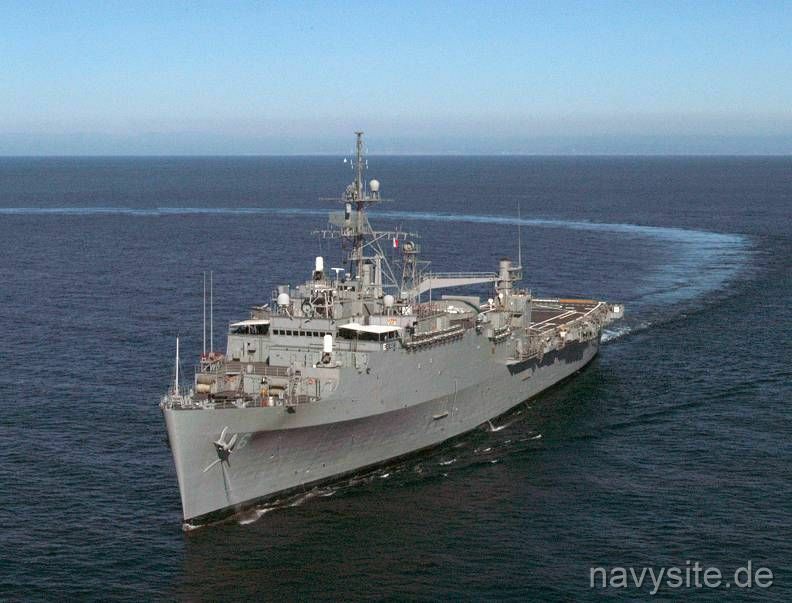 DULUTH arrived off Sri Lanka on 9 January 2005 and her crew and embarked Marines cleared helicopter landing zones, removed debris and helped clean up two devastated elementary schools. 28 September 2005: DULUTH decommissions at her homeport of San Diego. 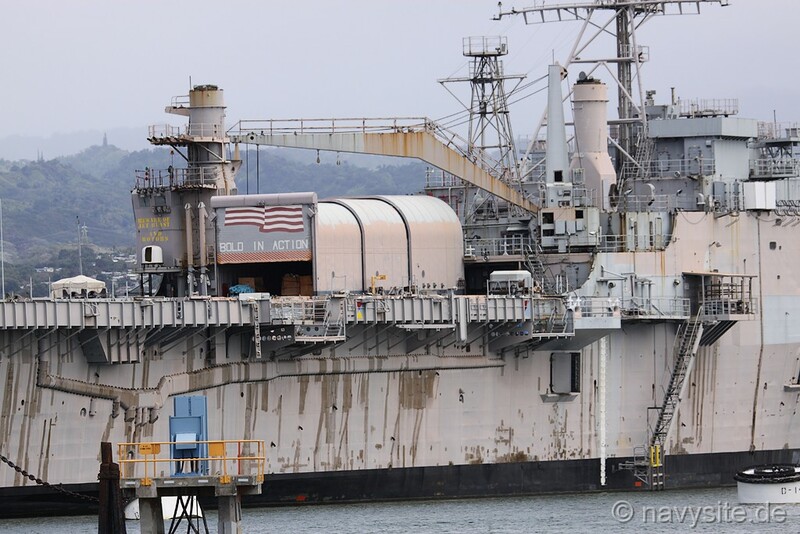 The photo below was taken by me on July 29, 2006, and shows the DULUTH berthed at the Naval Inactive Ships Maintenance Facility in Pearl Harbor, HI. The other ships are ACADIA (AD 42) [in front of DULUTH] and the two amphibious cargo ships DURHAM (LKA 114) [front] and ST. LOUIS (LKA 116). 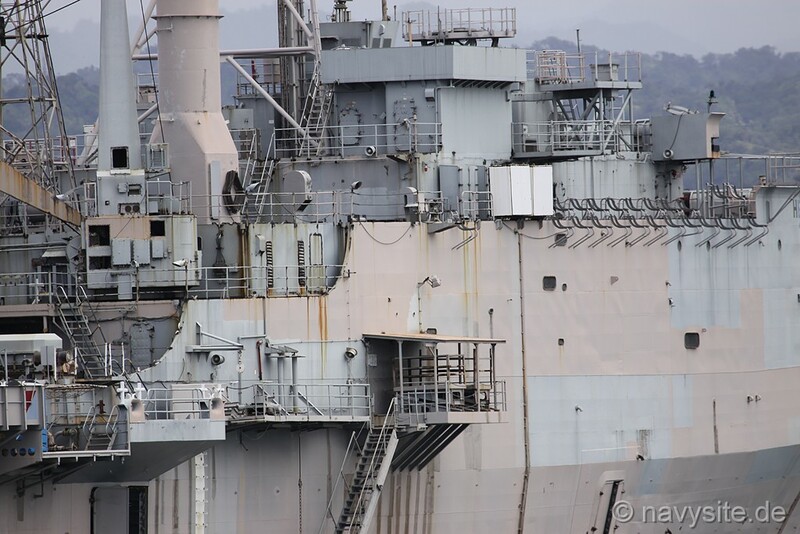 The photos below were taken by me and show the DULUTH laid-up at Pearl Harbor, Hi., on March 20, 2010.